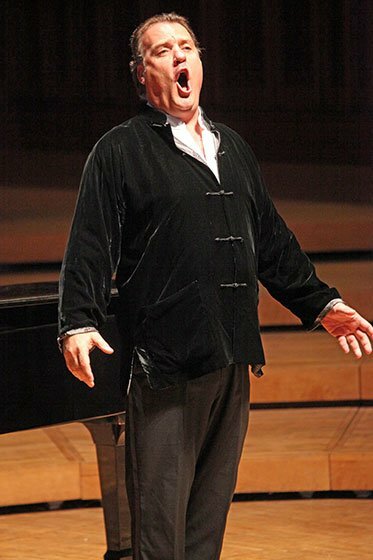 Recitals by the great Welsh bass-baritone Bryn Terfel have evolved, over the years, into love-ins. Audiences adore Bryn, and no wonder. He has a powerfully beautiful voice, is a charismatic actor, and has enough charm for a dozen singers. Bryn is a real stage animal, and if allowed, he would happily keep his programs going until well into the night. Surely, nothing would make his audiences happier. Bryn last appeared in recital at Tanglewood’s Ozawa Hall two years ago, and I was still over the moon about that amazing evening when he appeared Thursday night: same place, different program. People who love Terfel—and that includes most of those who were in the adoring audience every time I’ve heard him—don’t really care what his program will be. And this is just as well, because it gives him the latitude of programming exactly what he pleases. Renowned for his role of Scarpia (which he sang with the BSO on Saturday night) , and for his Wotan at the recent Met “Ring” cycle, Terfel has a stentorian voice that can project angelic tenderness as well. Pianist Nataliz Katyukova met his every nuance and mood. We heard an unusual concoction of French, Welsh, and German, then a tribute to John Charles Thomas (1891-1960), and a selection of arias from Terfel’s CD, “Bad Boys.” And that was before the very surprising encore. The French set began with two well-known Debussy mélodies, “Nuit d’étoiles” and “Mandoline,” both from the beginning of Debussy’s career. “Mandoline,” written in 1892, was one of the first Verlaine texts Debussy set. Two lovely songs by Gabriel Fauré, “Automne” and “Fleur jetée,” preceded Jacques Ibert’s rarely heard four Chansons de Don Quichotte, composed to mark the 400th anniversary of the publication of Cervantes’s Don Quixote, Part II. Bert was commissioned to write these songs for use in a 1933 film version of the novel starring Chaliapin. Terfel and his pianist captured the pomposity, delusions, and tragedy of the idealistic Don. Terfel hails from Wales, where men have a long tradition of singing together—one wonders if many of them sing before they talk. Four songs by 20th-century Welsh composer Meirion Williams (1901-76), famed for his vocal music, evoked the French composers who began the program and were imbued with utter loveliness. Hearing Terfel sing in Welsh, one often wonders if he saves his best voice and enunciation for this repertoire. A six-song medley of Welsh folk songs, which ended the first half, included “Dafydd y Garred Wen,” a dirge-like song also set by Benjamin Britten for harp and voice. Part Two featured dramatic renderings of Schumann’s Belsatzar, Opus 57, and two Venetian songs, followed by four Lieder (“Gruppe as den Tartarus,” “Liebesbotschaft,” “Das Fischermädchen,” and “Die Taubenpost”) of Franz Schubert, an early specialty of Terfel (on an all-Schubert CD worth hearing). The folksy fun was about to begin. “A Tribute of John Charles Thomas” (1891-1960) featured four songs, several familiar to Bryn’s audiences. John Charles Thomas had an international reputation in the 1910s, ‘20s and ‘30s and was, yes, Welsh, on his mother’s side (his grandfather was a coal miner in Wales). While singing regularly at the Metropolitan Opera, he became renowned to a larger audience during his time with the Westinghouse Radio Program from 1943 to 1946. Two of his big hits from that period were “Home on the Range” (which Terfel also sang here at his last recital) and “Lord’s Prayer,” both which Terfel sang with heartfelt gusto. Also included was “Trees” by Oscar Rasbach and, clearly Bryn’s favorite, “The Green-eyed Dragon” by Greatrix Newman, which allowed him to growl, something he seemed to enjoy enormously. The audience surely did. Then, there were three operatic “Bad Boys.” A deliciously naughty “Mack the Knife” was the highlight of these, then, pretending this was a normal recital, Terfel sang “Trade Winds,” by Frederick Keel, set to a poem by John Masefield. Nothing, even after all the recitals of his I’ve attended, though, prepared me for the encore that came next, “If I Were a Rich Man” Tevye’s over-the-top kvetch from Fiddler on the Roof. Bryn seemed suddenly to have melted into the stage and emerged as the real Tevye, almost miraculously. The man can certainly act, and gave the late Zero Mostel a run for his money. Were there no pictures from Thursday night? This picture is from a few years ago. The BSO does not always provide pictures. A slight omission Susan. You neglected to mention that “this symbolist poet” who wrote “Mandoline” was Verlaine. You are absolutely right. I meant to write Verlaine. My computer crashed last week, and took my brain with it.